For amateur purposes I might consider buying a budget microphone to record my vocals, as I have the thoughts that my current cheap home headset microphone won't suffice to get some quality. What specifications should I look for when deciding which microphone to buy? Caution: Professional mics like SM58 etc are supposed to be connected to pre-amps, mixers etc. If you connect a SM58 to your computer's inbuilt mic slot you'll get only a very feeble sound. Nowadays some voice-chat headsets come with very decent noise-cancelling mics. There are some clip-on condenser mics for use with computers too. Sensitivity: The ability to pick up low-volume sounds. Often given as something like "-65dB ± 5dB", which means that some frequencies will pick up sounds as quiet as -70dB, while some will be less sensitive. Higher value with less variance is better (remembering that you're dealing with negatives). Frequency Response: If a range is given, (eg. 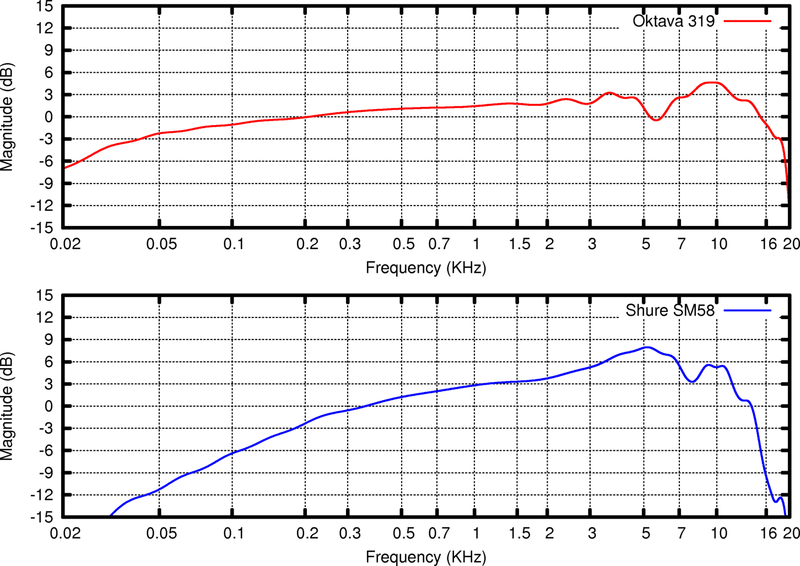 40Hz-16kHz), then this is the range of frequencies that the mic will pick up. A bigger range is better. Frequency response and sensitivity can also be displayed as a graph. In this case, the frequency response range refers to the range of frequencies where sensitivity is high. The graph gives far more information than the range. An example from wikipedia: The Oktava gives a more even response than the Shure. Look for a flat graph, as this gives even volume regardless of frequency. Polar Pattern: Sensitivity in a given direction. Omni directional microphones pick up sound equally from in front and from the sides. Directional mikes pick up more sound from in front. Shotgun mics are highly directional mics, and pick up sound a lot from in front, and only a little from the sides. Use omnidirectional mics for recording ambient sounds, and directional mics for targeted recording. Of course, there are many other factors, check wikipedia, and it's difficult to judge a mic purely by the specs. First, be careful with microphones that do not list certain specifications at all. Most of the time, if a microphone isn't accompanied with certain specifications, there is an obvious reason for it. Have a look at sensitivity, a microphone that is not sensitive enough can get you into having to turn up the volume of your pre-amplifier to such a level that it introduces noise. Secondly, check the frequency range. For vocal recordings, you should be good with most of the microphones, but some really cheap mics do miss a lot of low frequencies. Decide whether you wish to buy a condensor microphone or a dynamic microphone. While both can result in pretty good sound on vocal, a condensor microphone gets the transients better since its membrane is lighter (in weight), which means a plus to the intelligibility of the words. Drawback however is that a condensor mic normally should be used in conjunction with a pre-amplifier that has +48v phantom power. Also, take a look at the "self noise" levels, some are significantly higher than others. If condenser microphones (and the pre-amplifier with phantom power) is outside your price range, then I strongly recommend you take a look at the Shure SM58 dynamic microphone. You can get far cheaper microphones, but the SM58 has very usable sound and it's built to last. And I really mean last. I have three SM58 that I bought used more than 15 years ago. They didn't look too great when I bought them. In the meanwhile they've been dragged everywhere, dropped from an impressive range of heights, and even rolled in pools of water, coffee and beer from toppled cups and bottles. You can probably imagine they don't smell that great. But they just keep on going and going. I know you asked for specs, not specific models. But since your emphasis is on budget, a number of compromises must be made which completely depend on your style and preferences and the scenarios you intend to use the microphone for. What key features should I look for when purchasing a mic for podcasting?